Mirza Ghasemi is a typical Persian dish made with a base of eggplant, tomato, garlic, and turmeric. 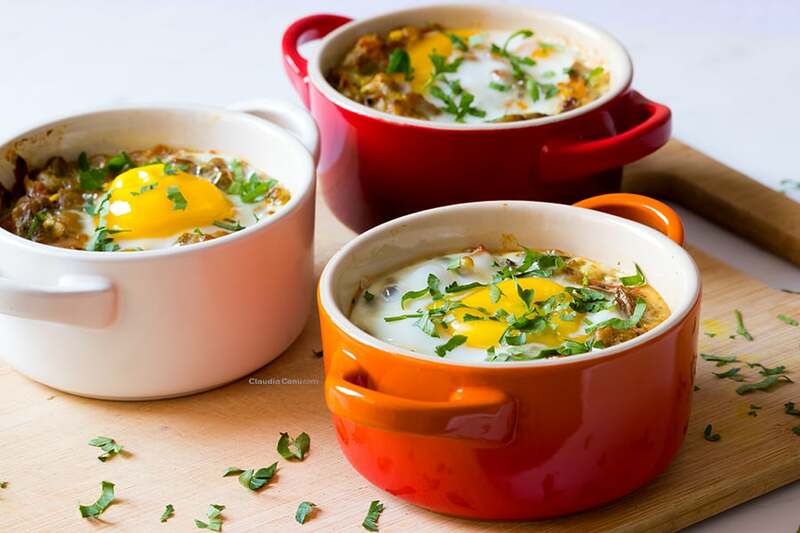 This version with the egg on top, instead of mixed with the sauce, is adapted to make it a perfect dish for a brunch but it can also be added to your weekly Healthy Meal Plan. It’s a healthy vegetarian recipe and is also gluten-free and dairy-free. What’s your favorite brunch dish that you think it actually defines a brunch? I can list several, but among the savoury ones, without a doubt, I would have to say a dish including egg. And for this reason, in the last few years, I have been looking for and testing recipes that include eggs. 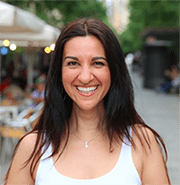 In one of the many brunches I enjoyed while in Barcelona, I tried the Mirza Ghasemi and it seemed so “exotic” and different from the typical dishes that were served in other restaurants, that I had to research and experiment at home. Nowadays, this is one of my go-to brunch dishes, especially when I have vegetarian guests. But I do prepare it during the week as well since it makes a good lunch or dinner. As you can see in the video, it’s not very complicated to prepare, but you have to take into account the time that you need to roast the eggplants, which is about 30 minutes. In some countries, Mirza Ghasemi is known as Iranian eggplant sauce and is usually served with some typical flatbread along with other sauces. The eggplants are usually grilled or, during the colder months, are roasted over the flame of a stove to give them a smoky flavor. 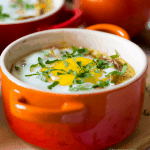 In the original version of Mirza Ghasemi, the eggs are mixed completely with the sauce. However, in this version, I have left the whole yolk because it looks more typical for a brunch dish. And since I have prepared them in these mini-cocottes that, by the way, I bought in Claudia & Julia’s online store; it’s as easy as adding the egg and putting the cocottes in the oven. Although, if you want to avoid the egg white turning completely white, covering the sauce, you can use a fork to mix it a little with the Mirza Ghasemi before baking. Be careful not to break the yolk though! Finally, in this version, I added half a red onion and dried mint, because, among the versions I tried, this is the one I personally like the most. But, as I indicate in the list of ingredients, they are optional. Why is this Mirza Ghasemi a healthy dish and the nutritional properties of eggs. Eggs have been demonized for many years because it was believed that their cholesterol would increase blood cholesterol levels and, consequently, the risk of cardiovascular diseases. In addition, as the egg yolk contains fat (including a certain level of saturated fat) and fat has long been considered as one of the bad macronutrients for our body (especially the saturated ones), it became fashionable to use only the egg whites of the egg or, at least, consume more egg whites than yolks. In recent years, however, it has been shown that our body is so smart as not to let its cholesterol level go up by ingesting a natural food that contains a high level of it, but wisely eliminates it alone, also, without us doing anything. A study has shown that people who consume eggs every day have a lower risk of cardiovascular disease than people who don’t usually consume them. In another study, it was shown that 15 out of 18 overweight men stopped suffering from metabolic syndrome, thanks to the consumption of eggs associated with a low-carbohydrate diet. Eggs are a complete “protein” of high biological value, which means that they contain all of the essential amino acids that our body needs to form the proteins it uses to function. At a nutritional level, the egg is an excellent source of almost all of the vitamins and minerals necessary for the human body to have good function ability and almost all of these nutrients are found in the yolk. Eggs, in addition, are a good source of antioxidants that protect our eyes. Finally, the egg is a natural source of vitamin D, even more so if it’s organic or free-range. Just a little reminder that vitamin D is essential to maintain good bone health since it is necessary for our organism to absorb calcium and phosphorus. The main source of vitamin D is the sun, but nowadays, with the use of sun creams and especially for people living in the city, there have been increased cases of people who need to take supplements. I, myself, had a few years in which my analytics indicated a vitamin D deficiency, until last year when my doctor told me that I had such a low level that I had to take supplements. So, if you have been afraid of the egg, now you know that in reality, it is a natural food that you could introduce into your healthy and balanced diet and get much more out of it. Of course, this does not mean that we are now “authorized” to eat three eggs a day. Remember that it’s important to always keep a balanced diet where we alternate all natural products (that have a mother or are grown from the earth). With this, I don’t want to offend any vegan or say that everyone should eat eggs. I respect everyone’s moral decisions and it’s great that we live in a society (in Europe at least) where we have the freedom to be able to make decisions like these. 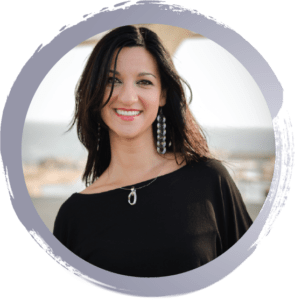 I believe that one’s priorities should be to understand how to take care of and nourish our body and that can be done by choosing any type of diet, as long as it’s based on natural foods and non-industrial products. I understand that during the summer you don’t feel like turning on the oven, but what we usually do in the summer are barbecues and, precisely because of that, I thought it would be a good idea to share this recipe. 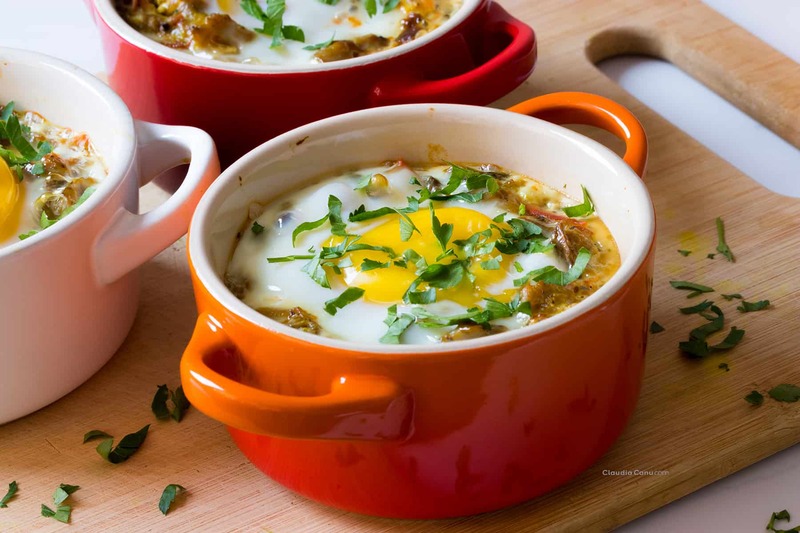 Prepare the Mirza Ghasemi in a pan and at the end add the eggs in the same pan. Or, if you have a cast iron pan, you can do everything on the barbecue, both the preparation of Mirza Ghasemi and cooking the eggs. Prepare the Mirza Ghassemi in a pan. Pour it into the baking dish. Make as many small “holes” in the Mirza Ghassemi for as many eggs as you want to prepare. Place the eggs in those holes. Bake for about 5 minutes, depending on how cooked you prefer the eggs. Keep in mind that when you see the yolk changes color, it means that the egg is getting hard. Finally, what I like most about this recipe is that you can prepare almost everything the previous day. If, for example, you have guests on a Sunday and you know that you are going to have a busy morning, you can prepare the Mirza Ghasemi the day before, only having to prepare the eggs when you are almost ready to sit at the table. When I have prepared this dish for a brunch with guests, there has never been anything left over. 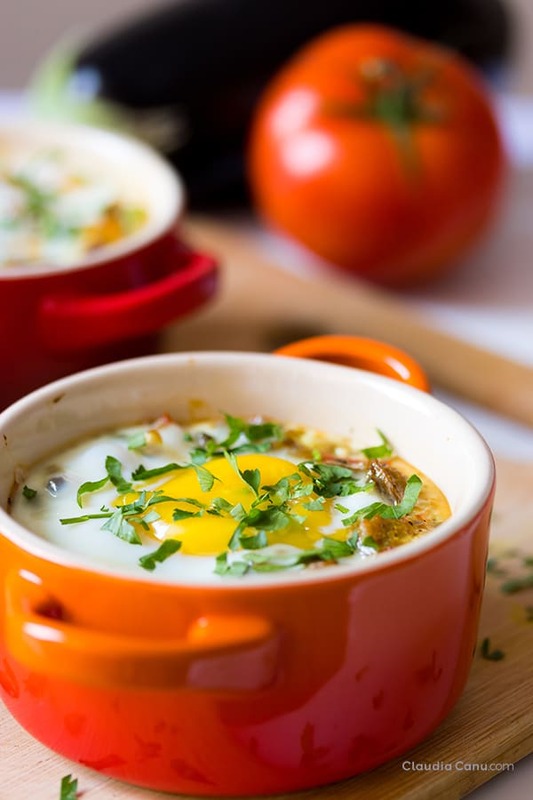 However, when I add it to my weekly food prep, what I usually do is prepare only the base without adding the eggs, and the day I want to eat it, I heat the quantity of Mirza Ghasemi that I’m going to eat and then I add the egg. This can be done in a cocotte, as you have seen in the video, but when I prepare it just for myself, I find it more practical to prepare it in a pan and close it with a lid once I add the egg. This way, I don’t have to use the oven for just one portion and this allows me to save time and electricity. What do you think of this recipe? Are you going to add it to your list of brunch recipes or even lunch and dinner? Pinch them with a fork over their entire surface. Bake them for 30 minutes. Turn them after 15 minutes. Once they are ready, remove them from the oven and wait for them to cool a bit to avoid burning yourself. Cut them into small pieces until they become like a sauce. Set aside the eggplants and cut the tomatoes, garlic, and onion. In a pan, add the oil and fry the garlic first, then add the onion and when these are done, add the tomatoes. When the tomatoes start to release their juice, add the eggplants and the spices and cook for about 5 minutes. 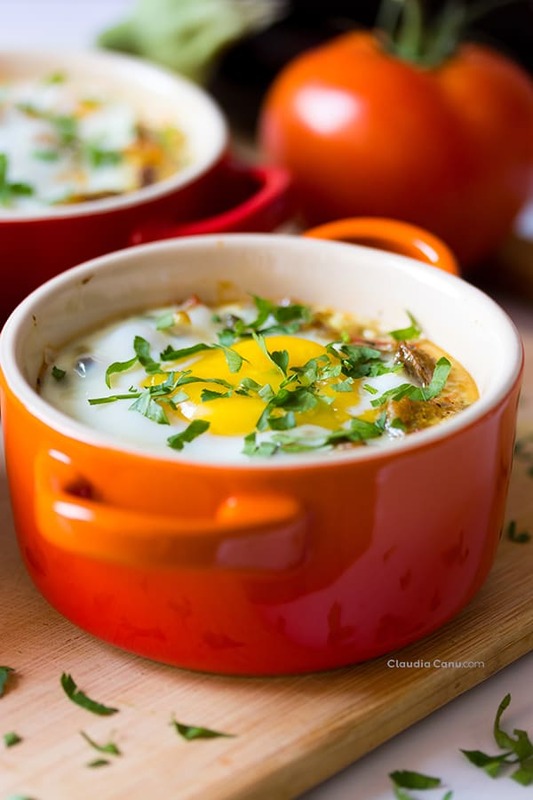 Pour the Mirza Ghasemi into the cocotte, add the eggs, using a fork to mix the egg whites with the sauce and bake at 180ºC (in a hot oven) for 5 minutes or more, depending on how you prefer your eggs done*. * If you don’t have these cocottes, in the paragraph “When to prepare this Mirza Ghasemi and on what occasions to eat it” I give you some suggestions. I’ve tried Mirza Ghassemi once in my life and I remember it was delicious. I want to try this recipe and I wish I could also have those cute little pots.